The number of homes for sale in Orem Utah typically fluctuates between 50-100 available homes. The Orem Utah real estate market was slow between 2007-2011. The market was full of Orem Utah short sales and Orem Utah bank foreclosures. In fact, during these years about 50% of the homes were distressed properties. However, at the begining of 2012 the Orem Utah Market started moving again and prices increased from 2013 to 2016. Homes are really selling quickly in Orem Utah right now. The number of homes currently for sale in Orem UT is 207. About 93 of those homes are new construction. Orem Utah home sales are increasing in new construction. Approximately 44% of the homes currently for sale are either under construction or to be built on the MLS. The Orem Utah market trends contributes to the determination of fair market value. For example, if pricing a Orem property for sale, the laws of supply and demand apply. In a seller’s market, the supply of real estate property is lower than the demand of qualified buyers. Therefore, the fair market value in a seller’s market would be higher. In a buyer’s market, the supply of real estate property is greater than the demand of qualified buyers. In that case, the fair market value would be lower. It is important to understand if the Orem Utah market is a buyer's market or a seller's market. If you are a buyer or a seller in Orem you need to know the current market trends. Feel free to conact Paul or one of his Orem Utah Realtors for an update of the current Orem UT market trends. Over the past few years around 25% of the homes for sale in Orem were short sales. The number of short sales is currently down to 24 and the majority of these homes has an offer in first position. Orem Utah Home Sales have decreased. The Short Sale and Bank Foreclosure Market is diminishing. Many buyer call wanting short sales and bank foreclosures in Orem Utah but they are becoming more difficult to find ones available. In the past few years 50% of the Orem UT real estate market was from Short Sales and Bank Foreclosures. If you are looking for a short sale in Orem contact Team Teasdale Realty. Our team will do our best to find you a short sale or bank foreclosure in Orem. The graph below actually represents the number of active listings for sale in Utah County. 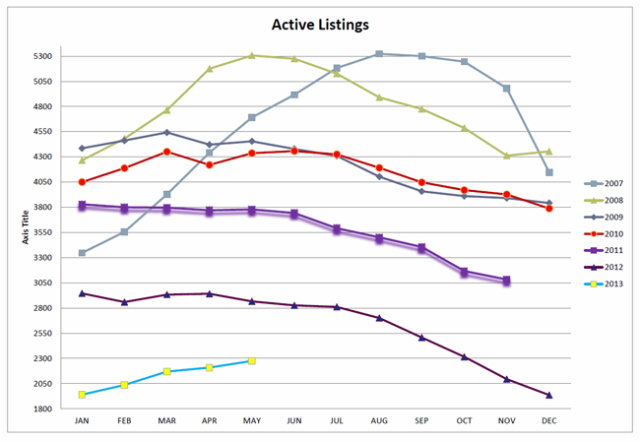 The inventory of homes for sale in Utah County has been decreasing. Our highest inventory was in 2007 and 2008. The inventory in 2009 and 2010 seemed quite constant with between 3,800 to 4,500 for sale throughout the year. The breakdown in inventory started in 2011 and in 2012 we saw a sharp decline in homes for sale. The Orem Utah home sales followed these same inventory patterns. In January of 2013 we saw the lowest level of homes for sale in Utah County with around 1,900 homes for sale. Orem Utah Home Sales will continue to be strong in 2013. The number of homes sold in Orem Utah is increasing. Approximately 29% of the homes on the MLS sold in May of 2013. Historically this is a very high number. The Orem Utah real estate market is a strong sellers market at this time and should remain strong unless interest rates rise up to the 6-7% range. If you look at the graph below you will notice the percentage of homes selling in Utah County has increased every years since 2007. We have to be careful not to create another bubble like the 2004-2007 market run up.